The need for higher energy efficiency in electronic products along with the emergence of new applications is driving growth of the active electronic components market, which is anticipated to expand at a CAGR of 8.4% during the forecast period from 2015 to 2023. The overall active electronic component market was valued at US$ 182.9 Bn in 2014. Earlier, these components were confined to be used for applications such as consumer electronics and printed circuit boards. However, nowadays these are dynamically used in applications such as automobile sector, space and satellite technology, and military applications. Rising trend towards the use of electric and hybrid vehicles and increase in the adoption of renewable energy sources is expected to contribute for high demand for active electronic components in the coming years. Most of the renewable energy fixtures consist of devices such as solar panels, turbines and invertors. These devices are further composed of active electronic components such as photodiodes and photo-transistors. Further, latest technological innovations in the active electronic components have fuelled the demand for miniature handheld devices such as smartphones, tablets and PDA’s. Along with this, miniaturized electronic components are also contributing in the development of smart wearable devices such as smart watches and smart wrist bands. On the basis of product types, the active electronic components market is segmented into semiconductor devices, display devices and others. In 2014, semiconductor devices segment held a significant share of the active electronic components market and is expected to register robust growth during the coming years. This growth is due to the increasing demand for energy efficient devices and product innovations in the electronic industry. Semiconductor devices segment of the active electronic components market comprises of diodes, transistors, integrated circuits and optoelectronic components. Integrated circuits are the most commonly used semiconductor devices which are primarily used in electronic products. Integrated circuits are also widely used in applications such as consumer electronics, radar communication systems and military equipment. The key applications of display devices include display systems, consumer electronics and medical electronics. In 2014, x-ray tubes accounted for the largest revenue share among the display devices of the active electronic components. In 2014, North America was the largest market for active electronic components globally. During the coming years, growth of active electronic component market in North America is expected to be supported by the growing use of renewable energy resources and the rising trend towards the use of electric and hybrid vehicles. The active electronic components market is fragmented in nature, with many global as well as regional players present in the market. The important strategy adopted by key players in the active electronic components market is geographical expansion of their businesses in order to address the varying and increasing requirements of the customers. For instance, Diotec Corporation is focusing on developing its global presence by setting up new facilities for its component production worldwide. The company established new sales offices in South Korea in 2014 and in Singapore in 2013. Prominent players in active electronic components market include Fairchild Semiconductor International, Inc., Infineon Technologies AG, Texas Instruments, Inc., Maxim Integrated Products Inc., ST Microelectronics NV, Analog Devices, Inc., ON Semiconductor, Diotec Semiconductor AG, NXP Semiconductors NV, Toshiba Corporation, Vishay Intertechnology, Inc., Everlight Electronics Co., Ltd., Panasonic Corporation and Renesas Electric Corporation. There are three types of electronic components namely: active electronic components, passive electronic components, and electromechanical components. Active electronic components rely on a source of energy (DC) and inject power into a circuit. Active electronic components include semiconductor devices, display devices, and others. During the last few years, technological advancements in electronics and semiconductor industry have enhanced the array of applications for active electronic components. Active electronic components include semiconductor devices and display devices. Various semiconductor devices include diodes, transistors, integrated circuits, and optoelectronic components. Further, display devices comprise of microwave tubes, cathode-ray tubes, x-ray tubes, photoelectric tubes, triodes and others. This research study, titled “Active Electronic Components Market – Global Industry Analysis, Size, Share, Growth, Trends, and Forecast, 2015 – 2023,” provides strategic analysis of the global active electronic components market, along with the market size in US$ Bn and growth forecast for the period 2015 to 2023. The report includes an in-depth analysis of the market drivers, restraints, and industry trends. It also highlights the significant growth opportunities for active electronic component manufacturers in the next few years. The research report provides a comprehensive assessment of stakeholder strategies, and the imperatives for succeeding in the active electronic components market. The report includes competitive analysis of various market segments based on types of active electronic components, and in-depth cross-sectional scrutiny across different geography segments of the active electronic components market. In order to aid in strategic decision-making, the report also includes the winning strategies adopted by key players operating in the active electronic components market. The report segregates the active electronic components market based on different geographies into North America, Europe, Asia Pacific, Middle East & Africa, and Latin America. 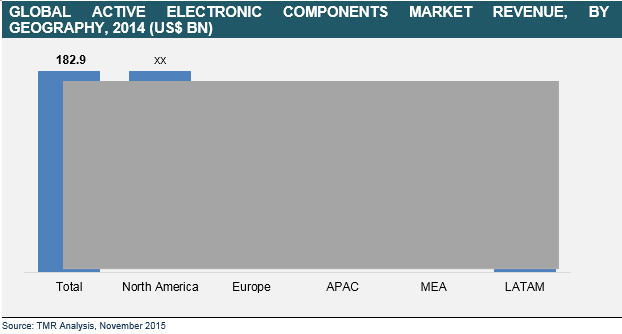 For detailed understanding of the active electronic components market, all these segments have also been estimated in terms of revenue (US$ Bn) for the geographies mentioned above. The market research study analyzes the active electronic components market worldwide, and provides revenue estimates in terms of US$ Bn for the years 2013 and 2014, along with the market forecast for the period 2015 to 2023. Market forecasts have been analyzed considering the impact of various economic, political, social, legal, and technological factors influencing market growth. Key players profiles in this study include Fairchild Semiconductor International, Inc., Infineon Technologies AG, Maxim Integrated Products, Inc, STMicroelectronics, Analog Devices, Inc., ON Semiconductor, Diotec Semiconductor AG, NXP Semiconductors N.V., Texas Instruments, Inc., Toshiba Corporation, Vishay Intertechnology, Inc., Everlight Electronics Co., Ltd., Panasonic Corporation and Renesas Electronics Corporation.